We're very pleased to confirm further supports line ups for Muse's summer stadium shows. Dizzee Rascal will be joining the bill at Stade de France, Paris on Saturday 22nd June. 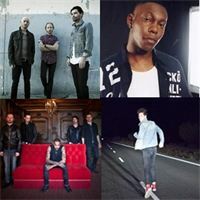 Skip The Use and Biffy Clyro will be appearing at Stade Charles Ehrmann in Nice on 26th June. And finally Bastille have been added to the line up at Amsterdam Arena on 4th June. Tickets for Nice and Amsterdam are still available. Click here for more info.